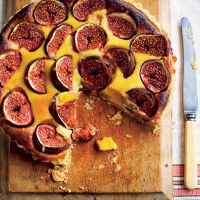 This simple pudding shows off the delicious combination of almonds and figs to good effect. Preheat the oven to 190°C/gas 5 and place a baking tray on a shelf in the top third of the oven. Line a 24cm loose-bottomed tart tin with the pastry. Put it in the fridge to rest for 30 minutes (or leave it in the freezer for 15 minutes if you’re short of time). Prick the pastry and line with baking parchment and baking beans; place it on the hot tray in the oven and cook for 10 minutes. Remove the parchment and beans and return to the oven for 8–10 minutes until golden. Allow to cool for 5 minutes. While the pastry case is cooling, mix the ground almonds, sugar, crème fraîche and egg yolks in a bowl until you have a smooth mixture; use to fill the pastry case. Trim the stems of the figs and halve them, then lay them closely together, cut-side up, on top of the mixture and push them in slightly; they will shrink during cooking. Bake the tart for 40–45 minutes, until the filling has set. Remove from the oven and allow to cool slightly. Serve warm or cold.